GREAT WHITE & SHARK ADVENTURES. SHARK ALLEY, GANSBAAI. SOUTH AFRICA. AAAX SPECIAL! Full day: R2 200 per person. Including transfers from Cape Town. 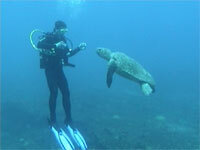 NO EXPERIENCE NECESSARY, FULLY CONTROLLED, NO DANGER, ECO AWARE, Boat or shark cage viewing. * Ages 6 to 60+ * All equipment supplied * Full day * Breakfast, Lunch and Refreshments * Just bring warm jacket, camera and sun-screen. GREAT WHITE SHARK DIVING AND VIEWING ENQUIRY FORM. Afternoon shark dive: R2 500 per person Including transfers from Cape Town. R3 490 per person Including transfers. 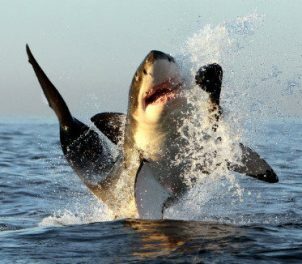 Great White Shark Breaching, (as seen on National Geographic) Natural Predation plus shark cage diving and viewing. 7 days R29560 per person. Including: Experienced Guide/Dive Master, 6 nights bed and breakfast accommodation, all transport and transfers from Durban, cylinders, weights and air. 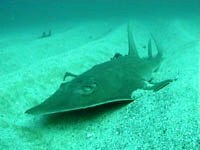 Dive the infamous: Aliwal Shoal 5kms off Umkomaas and 50 kms from Durban, Protea Banks and Rocky bay. Diving with Tiger Sharks (no cage) guarantees you one of the most exciting adrenalin-filled dives that you are ever likely to experience. The Aliwal Shoal with its large variety of sharks, diverse marine life and magnificent wrecks is without a doubt one of South Africa's finest dive sites C-cards and Log Books required. The last of the WORLD'S LARGEST FISH! 12 meters in length, 3000 teeth, come and join us for a swim. We pick you up from your accommodation in Diani and take you to our flagship, the fastest cruising boat along the Kenyan coast. On our slow cruise through the gap of the reef barier to Chale Island you get great views of Diani Beach, Galu Beach and the skyline of Shimba Hills. 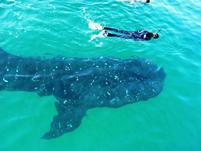 Whale Sharks, dolphins and various marine life are to be see along the way. 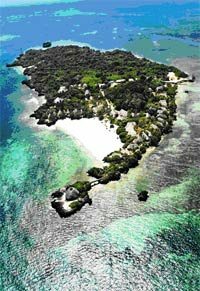 At Chale Island you can go for a swim, snorkel or dive in the crystal clear water and then go for a guided island walk through deep forests with an abundance of tropical birds, old coral formations and the nature of the island. Lunch is a mixture of African, Arabian and European dishes. After lunch we explore by boat the mangrove forests with it's large population of birds and crab. 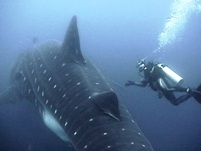 to view Whale Sharks, if any. Great White from Cape Town. Great White in Gansbaai. Great White near Dyer Island. 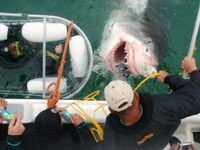 View Great White from boat or cage. See Great White in the Atlantic Ocean. Cape Great White at Seal Island. Great White in the Cape from catamaran. Cape Cod eaten by Great White. Guaranteed viewing: If you do not see a Great White Shark you can go again! 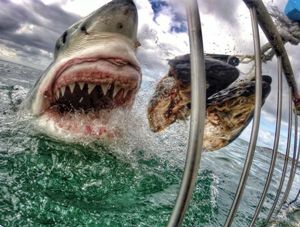 The opportunity to meet Carcharodon carcharias a 6 meter Great White Shark face to face and understand that this magnificent creature should be more respected than feared. Also view Fur Seals, Penguins, Whales (in season), Dolphins... Definitely an ‘extreme education’ if you are in Cape Town. One of the Big 7 must see. Lions, Elephants, Rinos, Buffulo, Leopard, Shark and Whale.